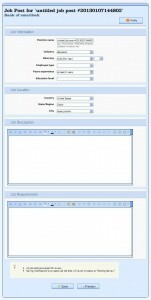 ADJE (Alcantara-Designs Job Engine) is a FREE job board software made using ASP.Net, DevExpress controls, and MySQL database server. It is highly customizable via CSS, HTML, control themes, and templates. Some features include: Resume upload, Medium trust hosting ready, Cufon Fonts, Templates, PayPal and DalPay Payment integration, Facebook share/recommend built-in, Google Analytics integration, and a lot more. This software was initially intended to be used internally for our own purposes, but I decided to share it with everybody who might want to put up their own job board website. The live demo is running on a read only database. You can interact with the interface, open edit forms and so on, but clicking on the “delete” or “save” buttons (or executing commands that modify data) will have no effect. You will see alert messages indicating problems during save, update or delete, so keep in mind that the database is running in read only mode. It is currently hosted on a Godaddy Shared Hosting server with Medium Trust, so it may run a bit slower than normal. I recommend a Virtual Dedicated Hosting server. Otherwise, try it on whatever you’ve got. While this web app software wasn’t developed with the novice user in mind, you don’t have to be a developer to get it up and running. If you have installed or maintained a blog website before this, then you will probably be fine. 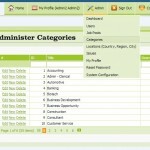 In your hosting controller, create a MySQL database called “adje”. 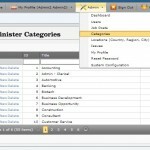 It is possible to use a different name for your database. Just make sure to change the database connection string in the web.config, and the database name in the import file you plan to restore. BLANK – A blank database. Not a single user or job post. Totally empty. sitename – Change to your website domain name. aes – This is the AES encryption key used to encrypt the passwords in the database. IF you imported the DEMO 2K database, then leave this setting alone for now. But don’t forget to change this when you switch to a blank database later on. 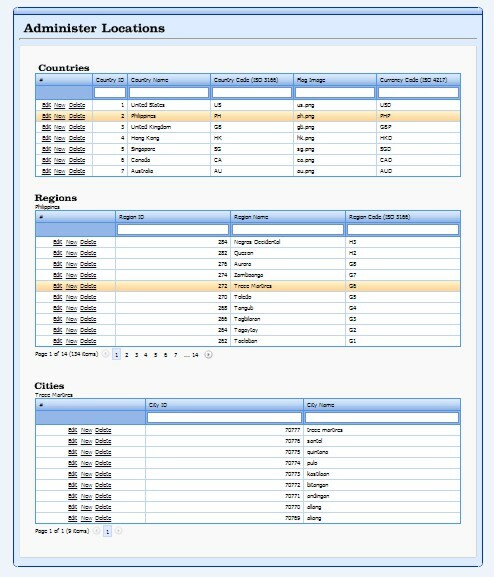 IF you imported the BLANK database, then change aes to a unique string sequence of mixed lower case, upper case, and numbers. 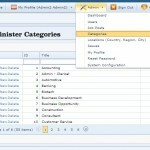 adje – Change the connection string server, user, and password values to point to your MySQL database. An edited version of the web.config file that has a valid connection string to your online adje database, and a matching aes value for the database you have imported. 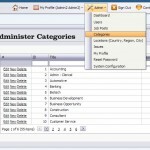 Set the target folder as an Application Folder in your hosting control panel. Using an FTP client, upload all of the files you have extracted to c:\adje to your hosting server. You can exclude uploading the ADJE_DB folder. After uploading the website files, go to your hosting control panel and change the permissions for the uploads folder (and everything in it) to read/write. This is the folder where user folders (and their files) are created and stored. This folder is protected by ADJE so files cannot be downloaded or hot-linked without proper user verification and authorization. That’s it! You should now be able to run the website. 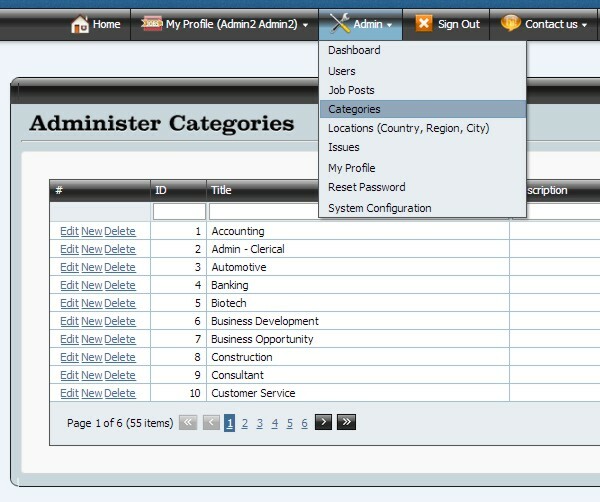 Read more about using ADJE features, website settings, and customization in the next few sections. If you encountered problems or have questions about installation, please proceed to the questions/suggestions/bug reports. ADJE uses templates that can be customized so you easily switch the look and styling of the website. A “template” is not a single file, but a collection of files in a folder called the template folder. The default repository for all templates is the folder ADJE_Templates. If you feel like creating your own template, just make a copy of the ADJE_Default folder and edit the copy. It is strongly recommended that you place all of your custom files inside your template folder to avoid being overwritten by future updates of ADJE. 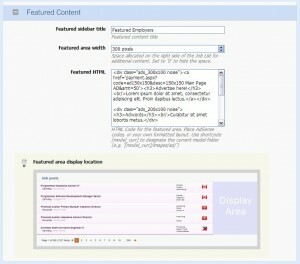 Header.html defines the area shown below. 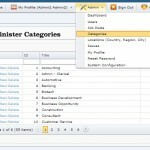 The Header Search Group will be overlapped on top of your header and is positioned (by default) on the right hand side. The header will be shown on all pages of ADJE. You can change all aspects of the header by editing Header.html, Header.css and Stylesheet.css files. Footer.html defines the area shown below. The footer is only visible on the main page. You can change all aspects of the footer by editing Footer.html, Footer.css and Stylesheet.css files. A small popup to credit the work I have done with ADJE will overlap the footer at the bottom of the page. All I ask is that you leave it on, for courtesy. It also contains the current version number running on your ADJE site. Images used by templates are stored in the template folders Images folder. It contains images for Facebook integration, Ads, the Header, the Footer, and the Favicon image (small icon on browser tabs). A Favicon is that small icon you see on browser tab next to the title of your website. The default ADJE favicon is contained in the current templates Images\Favicon folder. If you want to change the icon, simply change the file names favicon.ico with your own file. If you already have an image that you want to use as a favicon there are many free favicon generators on the Intenet that will allow you to upload an image and download an ICO (icon file) that you can use as favicon. Cufon fonts enable you to use ANY font you wish on ADJE. ADJE uses two special fonts contained in the current template folders Cufon folder. Cufon fonts are typically used for headings (H1 to H6) and it is discouraged to use them indiscriminately throughout the website (such as on the BODY tag) because it will slow down rendering the website. Cufon.js contains the html tags that will be replaced by the corresponding Cufon font. The clarendon_700.font.js and trade_gothic_300.font.js are the default fonts that comes with the ADJE_Default template. Above, you will see that section headings H1 to H6 tags will be targeted by the Cufon rendering engine for font replacement. The classes “.h1s” to “.h6s” are special classes for use in P or DIV tags and are generally used for sub-titles throughout ADJE. It’s really easy to replace one (or both) of the fonts on an ADJE template. The first thing you need to do is to find a suitable font to use and convert it to Cufon. Make sure you have the rights to embed the font on your website before you use it. There are a lot of free font resources on the Internet. Fonts typically have TTF or OTF file extensions. Next, modify the Cufon.js file and change the HTML tags where you want to apply your Cufon font. Finally, do not forget to remove any unused font js file. ADJE loads all fonts in the Cufon folder –even unused ones. Do not confuse Themes with Templates. ADJE themes define the look of individual controls (e.g. textboxes, checkboxes, grids, panels, buttons, etc.). Themes that are included with ADJE have been developed by 3rd party UI controls developer DevExpress. 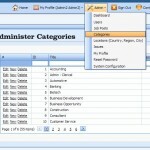 DevExpress includes a fully functional theme builder with trial versions of their software. I have not personally tried it, but if you feel strongly about customizing the skins or creating your own skin for ADJE, then consider downloading the time limited trial of their software. The following process needs to be completed for new ADJE websites. You will need to know all of the information contained in this section even if you only restored the DEMO 2K import file to test things out. Some of the things that will be discussed here include details like Email configuration, all the way to various integration options (Payment/Facebook/Google). 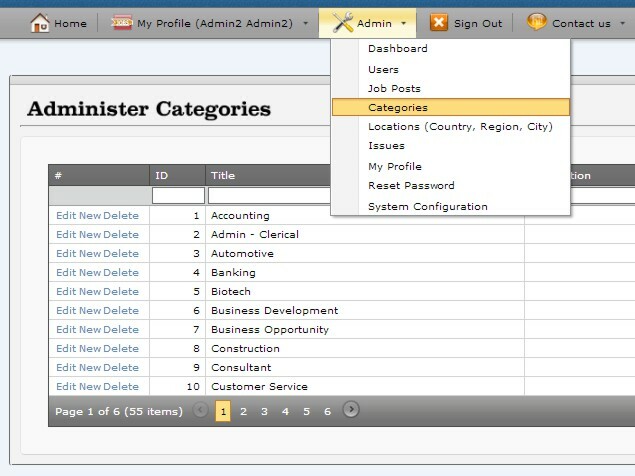 If you had imported the BLANK database you would need to create your first administrator account before you can continue to configure the website. This is the very first thing you need to do after you get your site up and running. 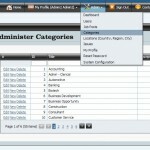 Opening the page init.aspx and fill up the details for the first admin user. init.aspx only shows up when there are no admin users on the database. 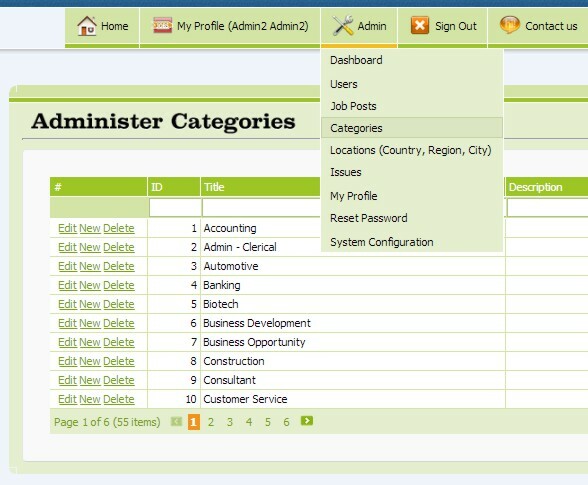 It will redirect the user to the main page if at least one admin user already exists in the database. This section enables you to change the appearance of the main page of your website. The different settings in this section controls the visibility of the Promo Section, Header Search Group, and Menu Bar Quick Search. Currently, all options on this pane are specific to Promotion Mode. Promotion Mode – This mode displays the promo.html file on the main page. The Promo.html file is stored in the current template folder (as defined in the web.config “sitemodel” entry). 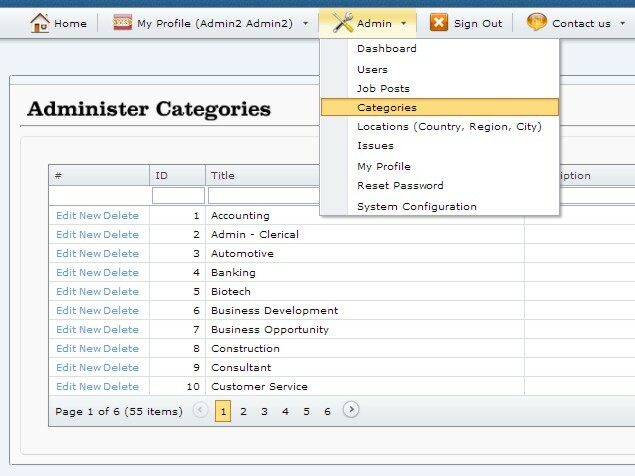 When the number of job posts in your database is below Search job min count the Header Search Group and the Menu Bar Quick Search will both be hidden. Live Mode – This mode hides the Promo section, which means that the main page is filled up by Job Post listing (and any side-bar content that you define). The Header Search Group and the Menu Bar Quick Search will always be displayed in this mode. Semi-Live – This mode displays the Promo section, the Header Search Group, and the Menu Bar Quick Search all together on the main page. It’s basically a “Live with Promo section” flavor of your current template. Applies when in Promotion Mode only. Hides The search bar until the minimum number of job posts are met. Set to ’0′ to disable (i.e. search will be enabled only when the site goes ‘Live’). Applies when in Promotion Mode only. Automatically sets ‘Live’ mode upon reaching this number of job posts. Set to ’0′ to disable (i.e. You must manually set the website to ‘Live’). 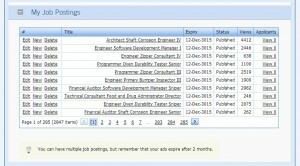 As job posts get added to the database, they will get displayed under the Promotion Section on the main page. This dictates the number of job posts to display while in Promotion Mode. 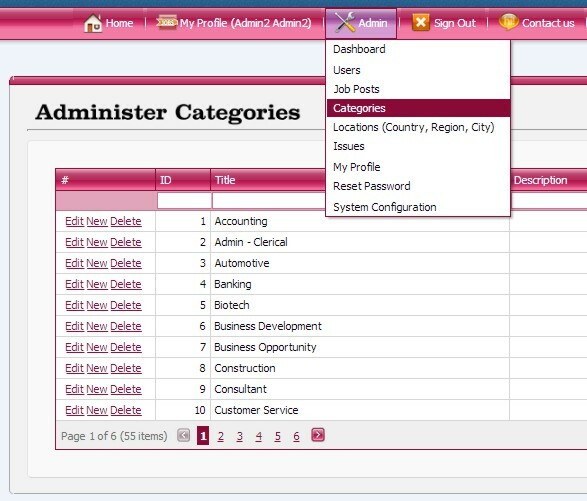 This pane contains options that help determine allowable parameters for the day to day operation of the application. Each option is explained in detail below. Number of failed login attempts before displaying captcha. 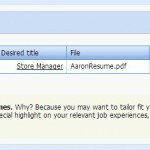 List of file extensions allowed to for resume upload. Associated Mime types in the same order as the list of extensions. Maximum number of resume records allowed. Number of months before job posting expires. Note that everytime the user edits the job post it’s status is set to ‘for review’ and once approved the expiration date is reset. New or edited job posts are normaly set to ‘For Review’ upon saving. 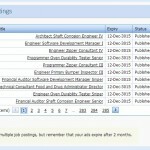 Only ‘Published’ posts appear on the job list. Setting this to “True” will set job posts to ‘Published’ status upon save by the user. Show/hide (recruiter) company logo on the main screen job listing. Number of job posts to display in ‘Live’ mode. Terms and conditions for the use of your website. All occurences of shortcode ‘[website]‘ (without quotes) will be replaced with your websites name (as taken from web.config). Credit-card processors and retailers like PayPal and DalPay may have specific requirements for what you need to place in your terms of service. Will be used for sending out registration emails. 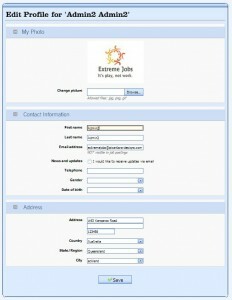 Will be used for sending out general information emails to registered users. Will be used for sending out administrative emails. Out going SMTP email server. 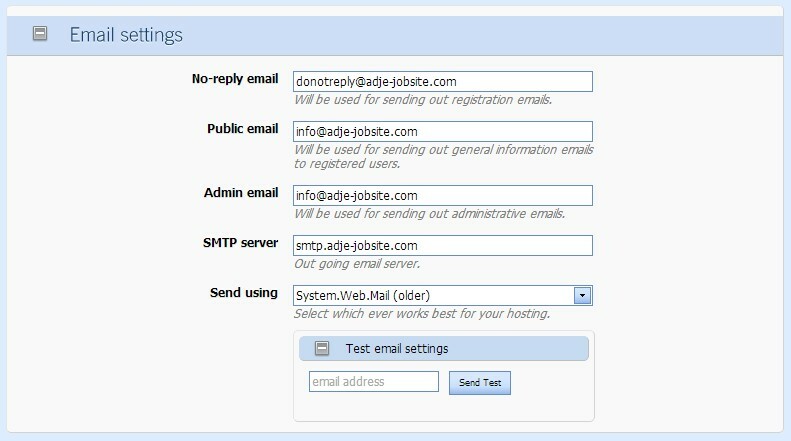 Choose which mail object ADJE needs to use in sending email. This value will depend on your server and so you should choose whichever works best with your hosting service. You can test the email settings before saving. 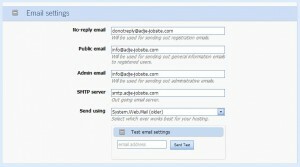 Test your email settings by entering an email address and click on the Send Test button. The Featured Content area is positioned alongside the job listing on the main page. You can specify the width of the area to be occupied (in pixels). This area can be used for whatever reason you want. I would normally put advertisement areas here for featured companies/jobs. You can place Google Adwords here if you like. Title to place above the sidebar content area. Space allocated on the right side of the Job List for additional content. Set to ’0′ to hide the space. Google has a lot of products that can be integrated with ADJE (Maps, Adsense, Analytics, and Checkout, just to name a few). Below is a list of Google products that have been integrated with ADJE. I will aim to integrate more of Google services as time permits. 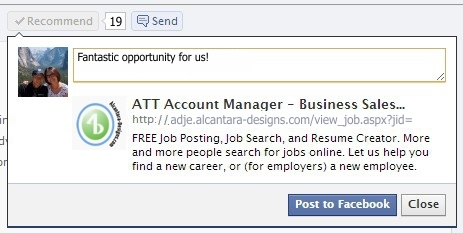 when someone clicks on Recommend, the title of the current job post will be included in your Facebook Timeline. Your website’s unique Facebook app ID for FB Like/Recommend. If you don’t have an AppID yet, then visit the Facebook Setup Page and request for it. File name of default image to be displayed when users ‘share’ or ‘like’ your site pages. The file must reside in the current template folder under ‘/images/facebook’. The image and should not be larger than 200 x 200 pixels. Default Facebook description for your site. Limit to 150 characters or less. Payment Link to be placed inside any of the customizable content (e.g. 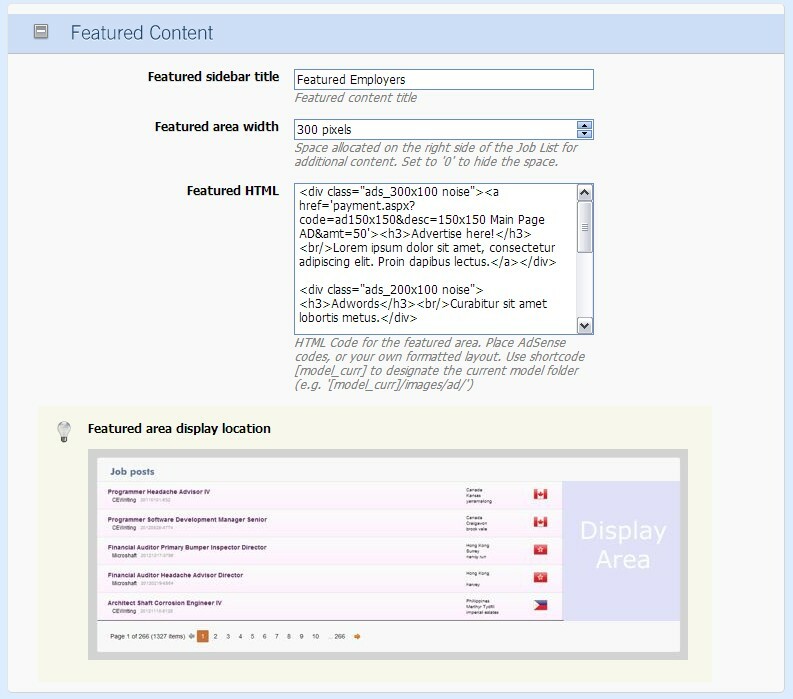 Header, Footer, Featured Content Area, etc.). 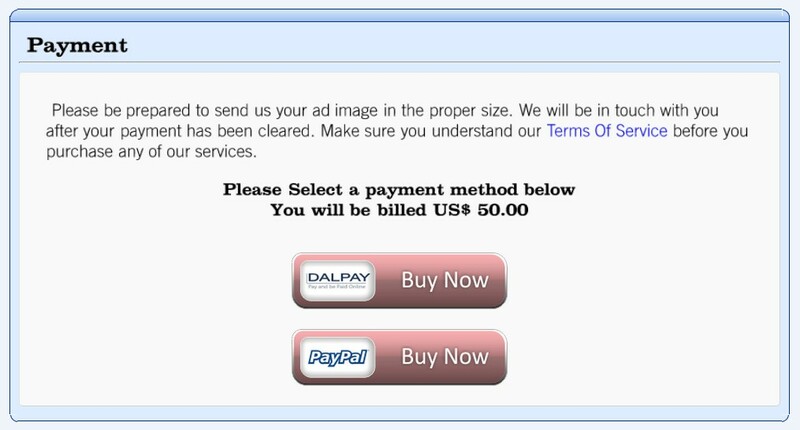 The payment buttons can be customized by replacing the payment button images in your current template. There are probably hundreds of Payment/Creditcard processors/gateways (and they sometimes prefer to be called ‘retailers’ of your services/products). For purposes of simplicity I will just refer to them collectively as Payment Gateway(s). Some of the more popular payment gateways are: PayPal, Google Checkout, 2Checkout, DalPay, etc. and the list is very long indeed. Each company provides a set of very specific instructions on how to use their “payment system”, and it is impossible to implement them all in one go. I have initially chosen a two I am familiar with (as a starting point) and integrated them into ADJE. More options will be added as time permits. Default payment currency is always expressed in US$/USD. After payment has been completed some Payment Gateways can be automatically redirected back to a thank you page called ThankYou.aspx. Other Payment Gateways need to be specifically told to redirect back to ThankYou.aspx by setting configuration options from the Payment Gateway Website using your account with them (i.e. you need to do that yourself by logging into your account with them). 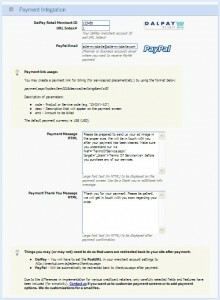 If you want to see how it looks like then click on this Payment Link which uses the sample above. 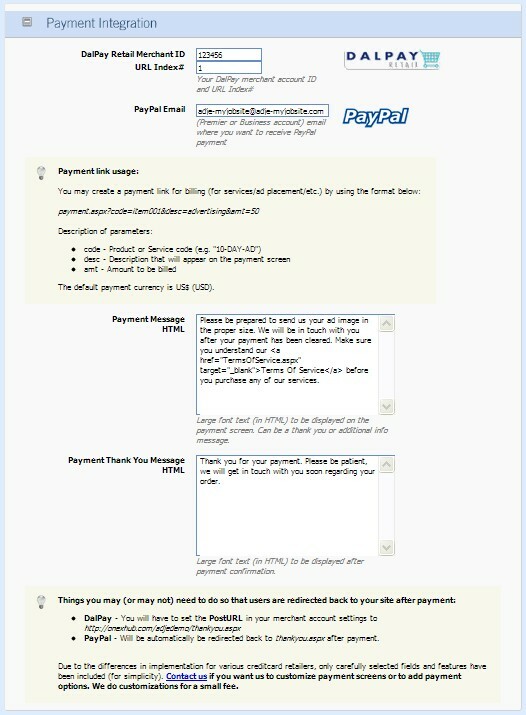 Note that the Payment Gateways will not work (i.e. you will not be able to pay for real, or in testing) because only dummy email and merchant ID’s are used in the Payment Integration pane. After Payment Action: Users will be automatically be redirected back to thankyou.aspx after payment. Large font text (in HTML) to be displayed on the ADJE payment screen. Can be a thank you or additional info message. Large font text (in HTML) to be displayed as thank you message (shown here). The Dashboard shows you recent activities on your ADJE website. All information displayed here is intended to give you a snapshot of the current status of ADJE and what has changed since you last signed-in (unless otherwise indicated). New Users Displays the number of new users since your last sign-in. 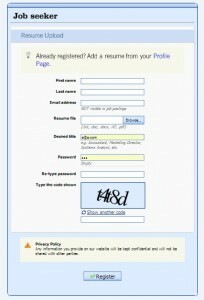 New Job Posts Displays the number of new job post(s) since your last sign-in. 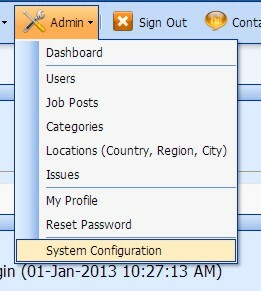 New Issues Technical Issues are automatically logged by ADJE. Problems like email sending failure, Users attempting to access areas that they are not allowed to access, and other issues will be logged here. Edit Opens the User Profile page for the user being edited. You will have exactly the same view as when the user is editing his/her profile, so be careful not to change anything! An extra Admin Options pane at the top of the page will enable Admins to change the user's Status (New, Active, Suspended) and Type (Admin, Recruiter, Applicant). Job posts for users that have suspended accounts will not be displayed on the main page job list. New Creates a new user record and opens the User Profile page for editing. 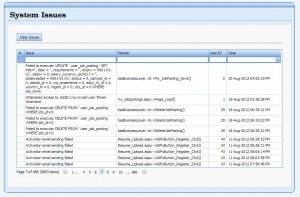 Delete Deletes the user record and ALL associated records and files (job post, resume, etc.). Although all user files will be deleted, the user folder where those files are stored (uploads\[user id]) will not be deleted to prevent the Web Application from restarting. 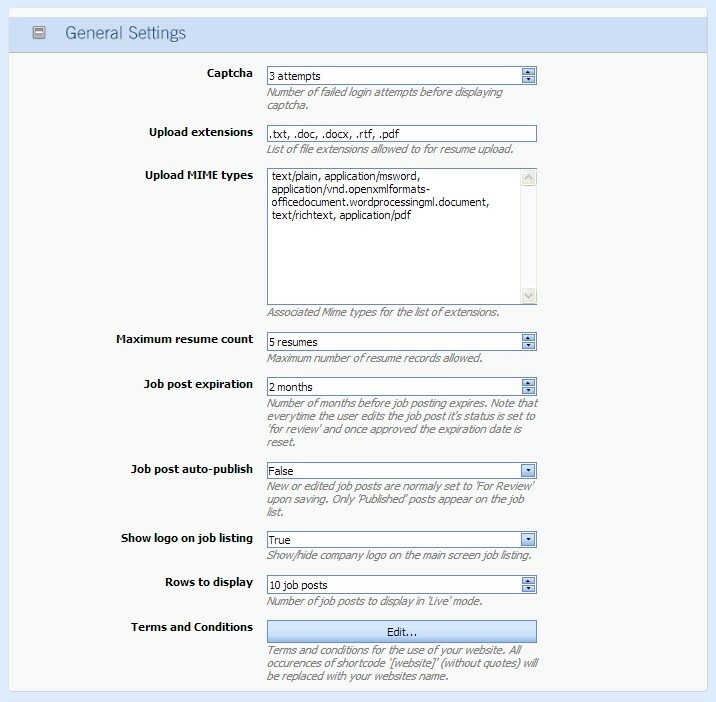 Edit Opens the Job Post page for the job post being edited. 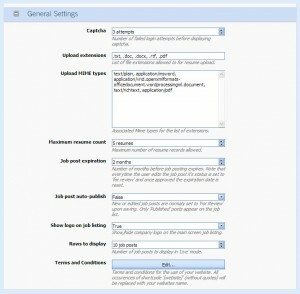 You will have exactly the same view as when the user is editing his/her job post, so be careful not to change anything! 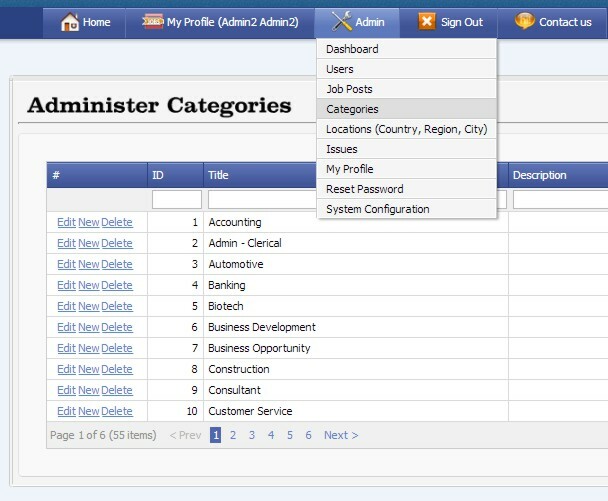 An extra Admin Options pane at the top of the page will enable Admins to change the job posts Status (Incomplete, Pending Review, Published, Deactivated, Disapproved, Paused). Delete Deletes the job post. Preview Opens the Preview Job Post page to allow you to view the job post exactly as users on your website will see it. 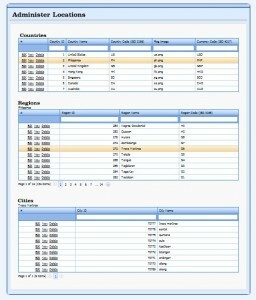 The ADJE database (both BLANK and DEMO 2K) contains a selected set of data for countries, regions, and cities. The data was obtained from one or more downloadable open source import files from the Internet. It is quite difficult to compile a 100% accurate list, which is why I added an administration page for correcting or adding new items to the list. Regions This grid defines the list of regions in ADJE. 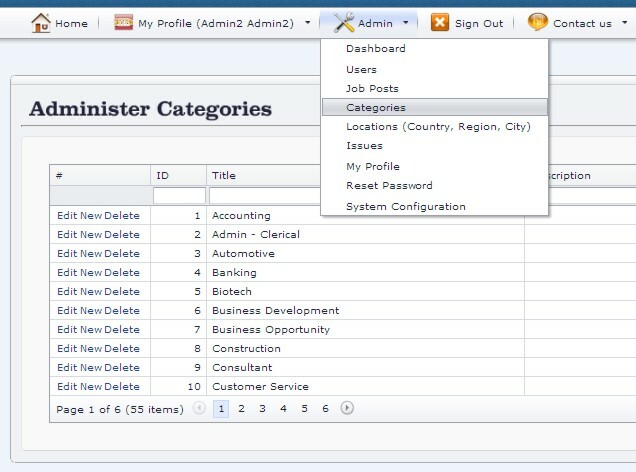 You must first select a country before the regions grid gets populated. The list appears on various dropdown boxes throughout the system, mostly where address input is needed. There are currently 446 regions entered in the database for the included countries in ADJE. Cities This grid defines the list of cities in ADJE. You must first select a country and a region before the cities grid gets populated. 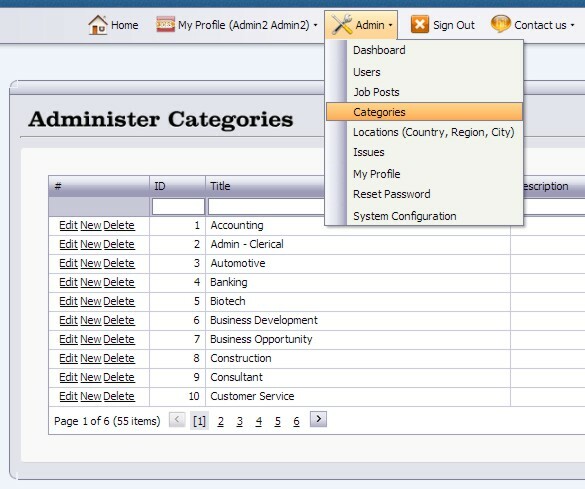 The list appears on various dropdown boxes throughout the system, mostly where address input is needed. There are currently 214,613 cities entered in the database for the included countries and regions in ADJE. Email sending error Check your Email/SMTP settings. Sometimes, your website will be up and running fine and then all of a sudden the email service will stop working. In those cases you should check with your hosting service provider as they probably changed something. In my experience, the service providers will blame the software (i.e. your website) and no amount of insistence that 'it worked fine for X months' will convince them otherwise. In that case, I insist some more and ask to get the latest settings for the email server. It is normal for them to migrate your website to new servers without your knowledge. 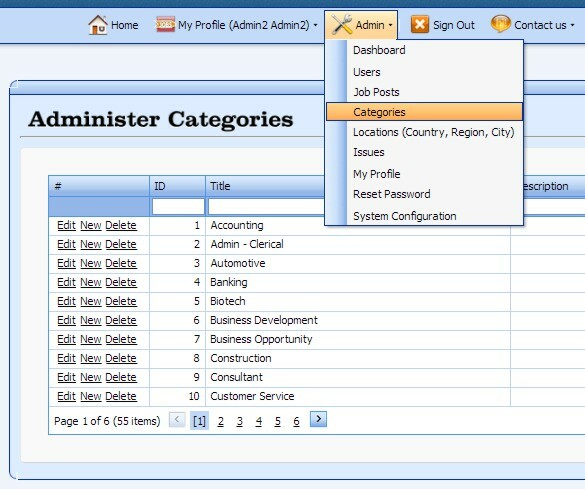 Attempted Access by Invalid user ADJE allows users to edit/delete/update their own records (job post, resume, etc), but limits access to other users data. If a user attempts to change the browser URL to specify a resume id or a job post id that the user does not have ownership over. You need to decide what to do with these type of users. If they do it often enough (as evidenced by the logs) then you may have to send them a warning that they need to stop what they are doing or their account will get suspended. 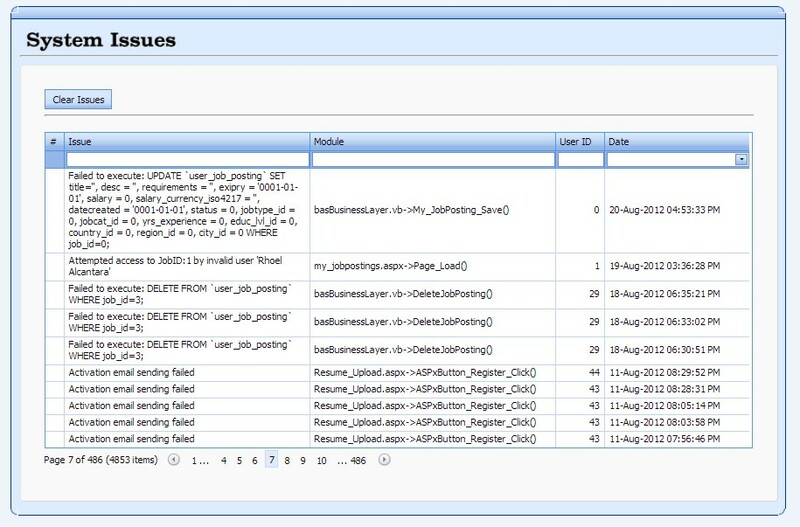 Failed to execute query ADJE modules have built-in error detection codes that log technical problems. If your ADJE is running correctly then you wouldn't see any technical issues in the log. However, if you see something in your log that you cannot easily understand, then FIRST SEARCH the Support Forums for answers, and if you can't find anything that matches your problem then please post a new topic for it. 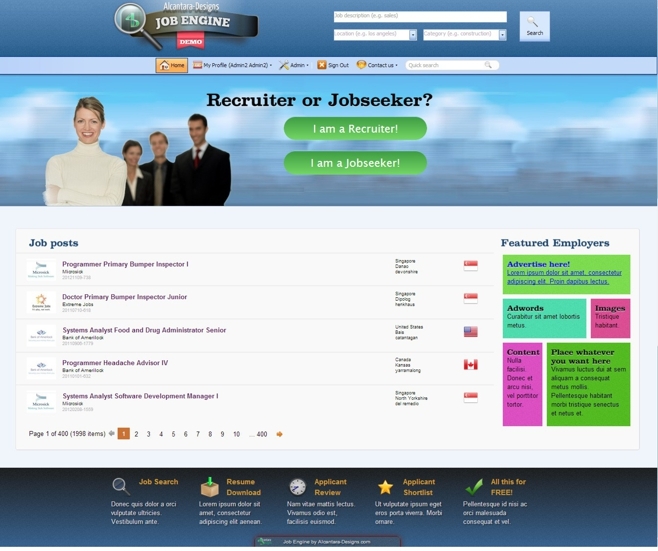 This page enables registration of new employers/recruiters. 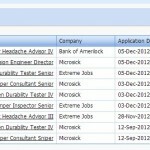 It can be accessed by clicking on the main menu item Post a Job. If you want to place a link to the registration form elsewhere (e.g. 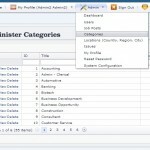 Promo or Footer Section) the you can create a link to the employer registration page: Register.aspx. 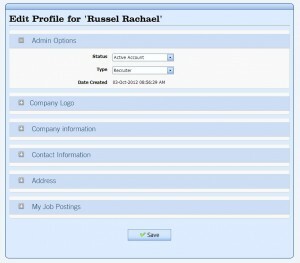 After a new employer completes the information on the form, an email will be sent out to the users registered email address. He/She would then have to click a link to verify the email address. If a user is unable to pass the verification procedure, the user account will remain in an “unverified” status. Unverified users will not be able to use ADJE features that are reserved for registered users (e.g. job posting, etc). Administrators can override the status of users in the User Administration form. 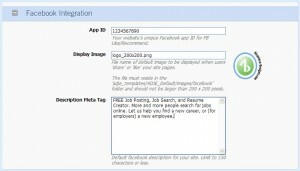 This page enables registration of new job seekers. 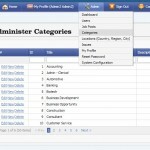 It can be accessed by clicking on the main menu item Submit Resume. If you want to place a link to the registration form elsewhere (e.g. 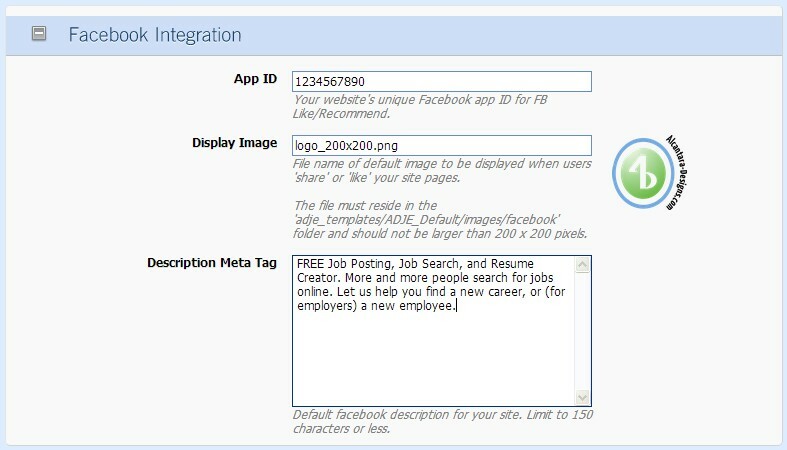 Promo or Footer Section) the you can create a link to the job seeker registration page: Resume_Upload.aspx. 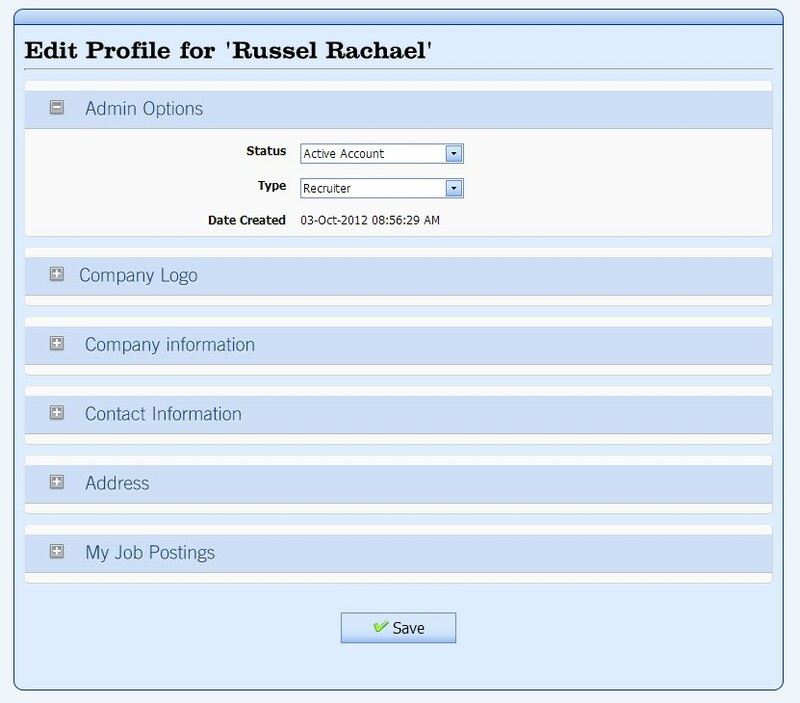 After a new job seeker completes the information on the form, an email will be sent out to the users registered email address. He/She would then have to click a link to verify the email address. 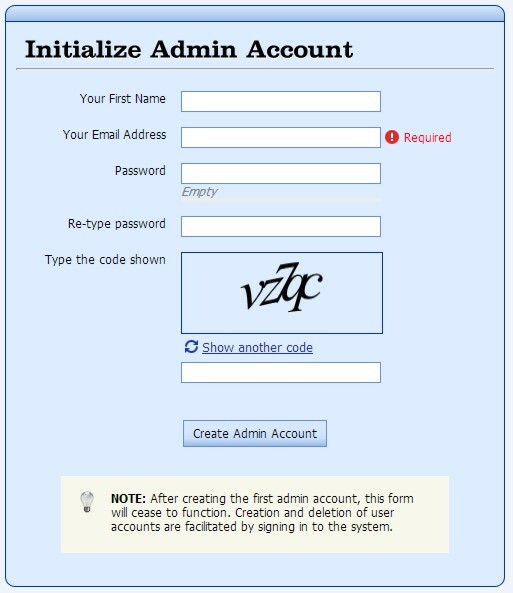 If a user is unable to pass the verification procedure, the user account will remain in an “unverified” status. Unverified users will not be able to use ADJE features that are reserved for registered users (e.g. resume creation, job application, etc). Number of views – Shows the number of page views the job post gets. Number of applicants – Shows the number of applicants for the job post as determined by the number of applicants who clicked on the Apply Now button on the View Job Post page. 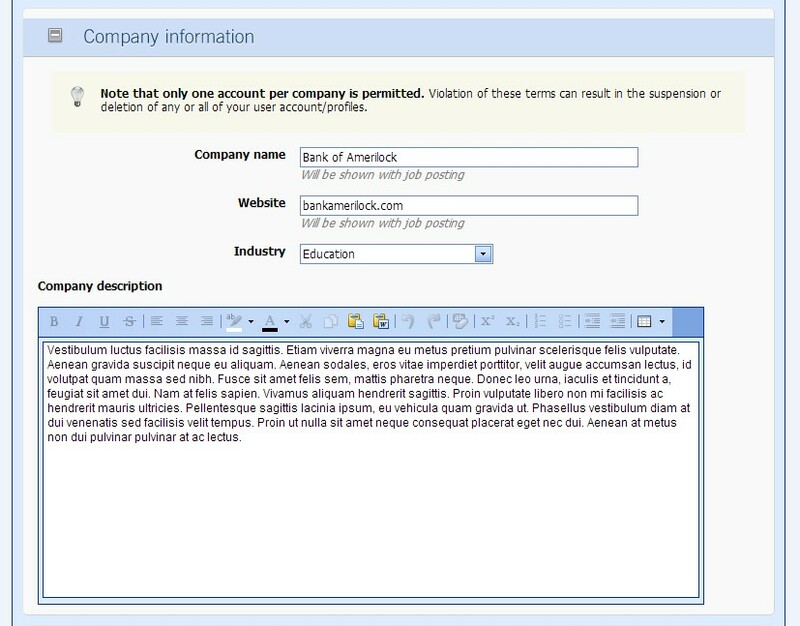 Some employers/recruiters will place email addresses or url’s on their job posts. 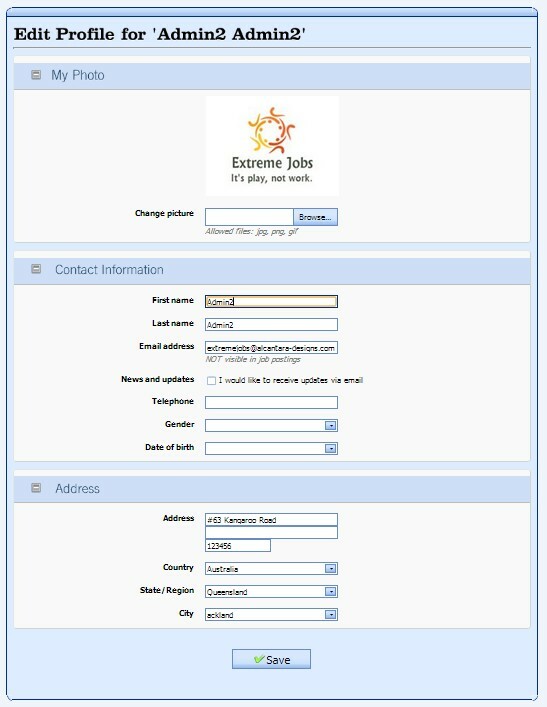 It is not possible for ADJE to count the applicants that directly contact the employer (instead of clicking the Apply Now button. 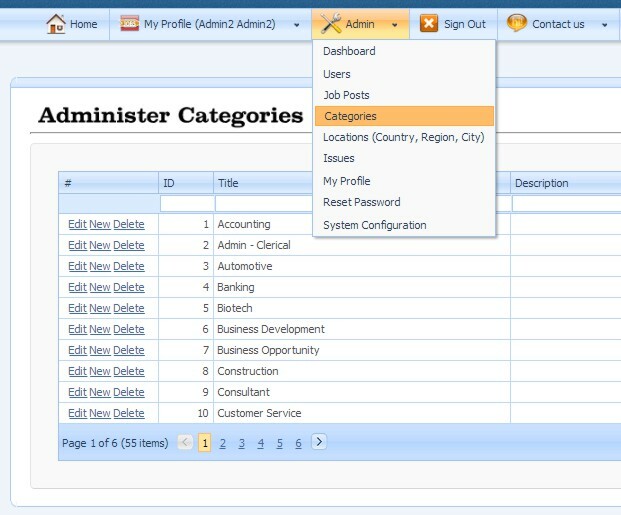 When a new job post is created the Address and Industry fields will be filled with default values taken from the users profile. 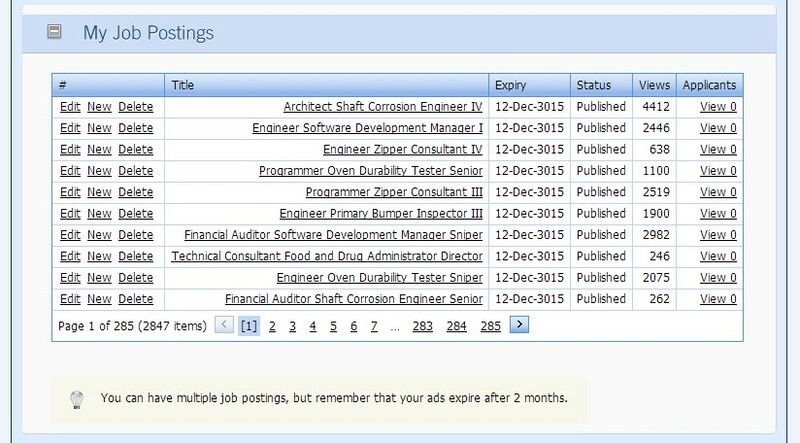 Published – When ADJE is set to Auto Publish any saved job post will be immediately visible on the main job list page. 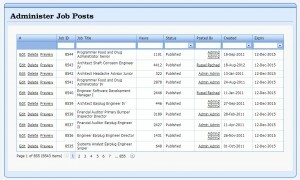 Incomplete – When the user creates a job post without saving it, the job post will have a status of Incomplete. This type of job post is not published on the main page, plus, the user will not be allowed to create a new job post until he/she has successfully updated (and saves) the (incomplete) job post record. 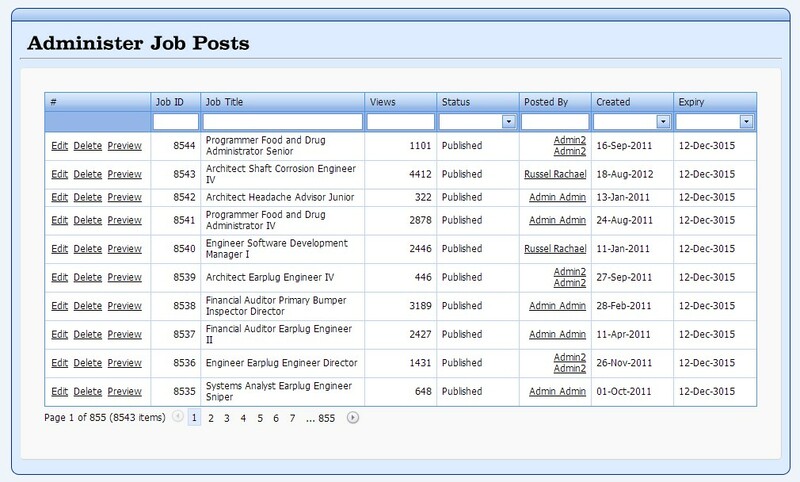 The status of job posts (including expiration) is visible in the users User Profile on the My Job Posting grids Status column. 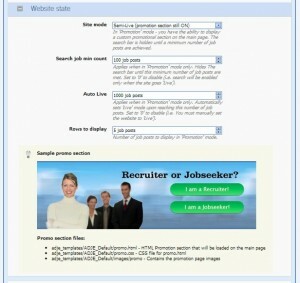 The Preview button will show users exactly how the job post will appear for ADJE site visitors. 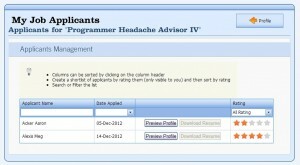 The Applicants column will show exactly how many applicants have clicked on the Apply Now button for any job post. In the sample image above, clicking on the View 2 link will take the user to the My Job Applicants page which shows all applicants for the particular job post. 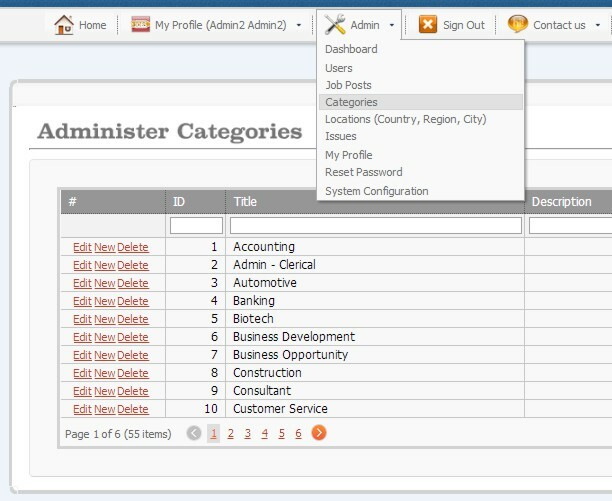 The Applicants Management pane shows all the applicants for the selected job post. Each applicant can be given a rating, which helps in making a short-list of applicants for the job post. 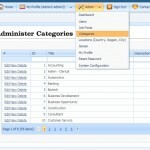 Columns can be sorted by clicking on the grid header column title. 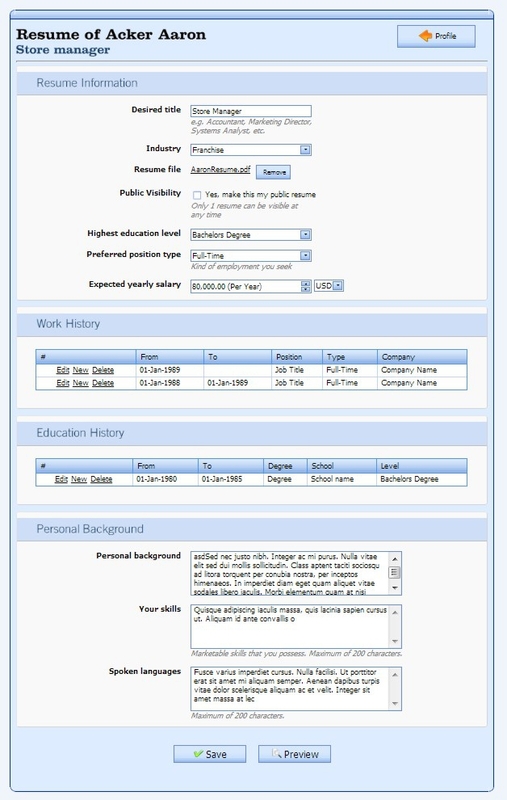 When an applicant submits an application, the applicant also selects from one (of possibly several) resumes that he/she has on record in the ADJE resume database. 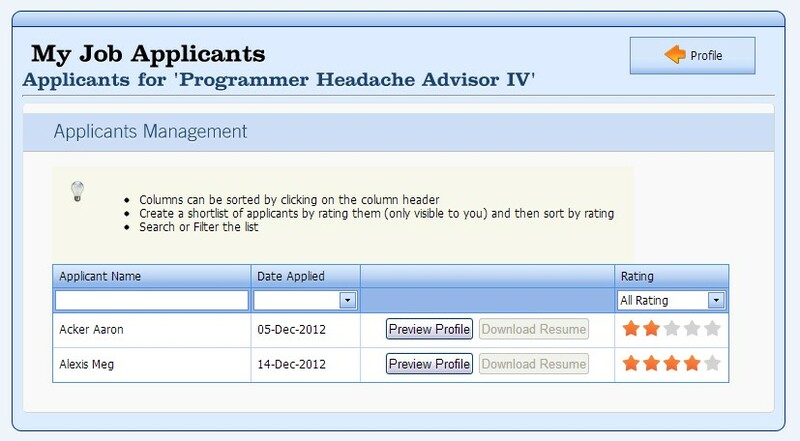 That online resume is made available to the employer when the employer clicks on the Preview Profile button. The report generated is based on the users profile on ADJE, which will include other information that the user entered in our database (e.g. work experience/employment history, and educational background). NOTE: The online resume can be printed or exported to PDF. 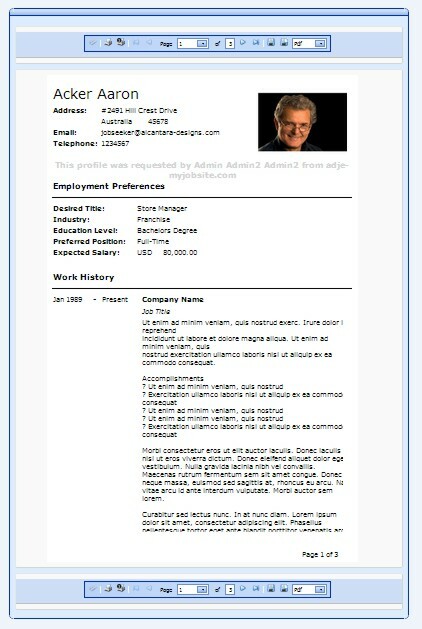 Also, it is not uncommon for applicants to also have a PDF/DOC/TXT File of their resume associated with their online resume on ADJE. If available, employers may download that resume file by clicking on the Download Resume button. A download link will be provided, but in most cases the browser will automatically download the file. The download link will only work when the employer/recruiter is signed-in to his/her account. ADJE checks to ensure that job seeker resume files are always kept confidential and secure, and can only be accessed by employers/recruiters that they applied to. 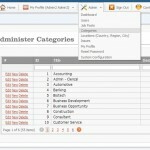 Each job seeker can add a limited number of online resumes based on the Maximum Resume Count setting. 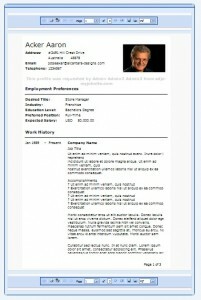 Clicking New will bring up the My Resume page where the user can fill up all details pertaining to a particular resume. 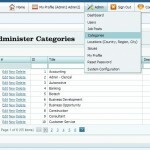 The Duplicate link allows users to quickly duplicate resume records. 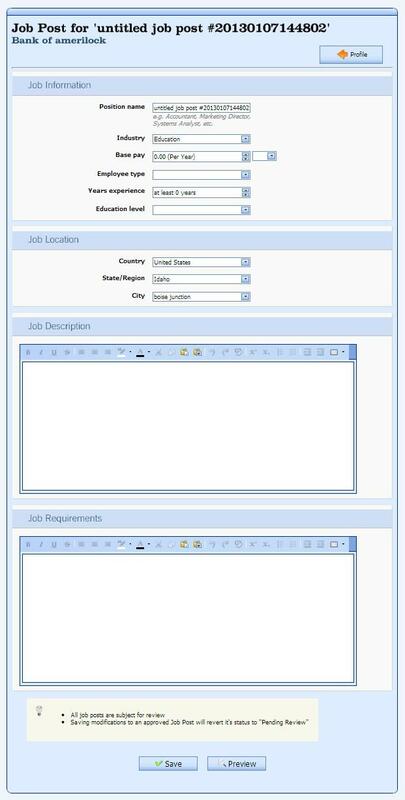 This pane shows a job seeker all of the job posts that he/she has applied to. 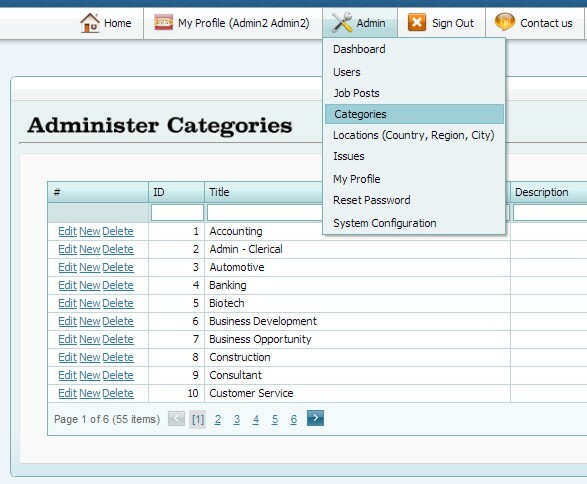 This grid will also show when the employer/recruiter has viewed the job seekers application in ADJE. There is a separate page dedicated to the version history and change log. You can access it HERE.